Draft: 2011, Texas Rangers, 30th rd. Curtis Granderson doubles (24) on a fly ball to left fielder Jimmy Paredes. Asdrubal Cabrera singles on a sharp ground ball to shortstop Andres Blanco. 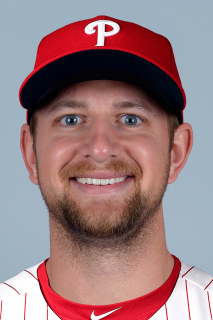 December 14, 2016 Philadelphia Phillies released RHP Phil Klein. September 10, 2016 Philadelphia Phillies recalled RHP Phil Klein from Lehigh Valley IronPigs. August 4, 2016 Philadelphia Phillies optioned RHP Phil Klein to Lehigh Valley IronPigs. August 3, 2016 Philadelphia Phillies recalled Phil Klein from Lehigh Valley IronPigs. June 19, 2016 Philadelphia Phillies claimed RHP Phil Klein off waivers from Texas Rangers. June 19, 2016 Philadelphia Phillies optioned RHP Phil Klein to Lehigh Valley IronPigs. June 9, 2016 Texas Rangers designated RHP Phil Klein for assignment. May 6, 2016 Texas Rangers optioned RHP Phil Klein to Round Rock Express. April 21, 2016 Texas Rangers recalled Phil Klein from Round Rock Express. April 13, 2016 Texas Rangers optioned RHP Phil Klein to Round Rock Express. October 15, 2015 Texas Rangers activated RHP Phil Klein. October 5, 2015 Texas Rangers recalled RHP Phil Klein from Round Rock Express. August 6, 2015 Texas Rangers optioned RHP Phil Klein to Round Rock Express. August 2, 2015 Texas Rangers recalled Phil Klein from Round Rock Express. August 1, 2015 RHP Phil Klein assigned to Round Rock Express. July 29, 2015 Texas Rangers optioned RHP Phil Klein to Round Rock Express. July 27, 2015 Texas Rangers recalled Phil Klein from Round Rock Express. June 28, 2015 Round Rock Express activated RHP Phil Klein from the 7-day disabled list. June 17, 2015 Round Rock Express placed RHP Phil Klein on the 7-day disabled list. May 28, 2015 Texas Rangers optioned RHP Phil Klein to Round Rock Express. May 20, 2015 Texas Rangers recalled Phil Klein from Round Rock Express. April 15, 2015 Texas Rangers optioned RHP Phil Klein to Round Rock Express. August 1, 2014 Texas Rangers selected the contract of Phil Klein from Round Rock Express. June 25, 2014 RHP Phil Klein assigned to Round Rock Express from Frisco RoughRiders. February 28, 2014 RHP Phil Klein assigned to Texas Rangers. August 23, 2013 Frisco RoughRiders activated RHP Phil Klein from the temporarily inactive list. August 14, 2013 Frisco RoughRiders placed RHP Phil Klein on the temporarily inactive list. May 1, 2013 RHP Phil Klein assigned to Frisco RoughRiders from Myrtle Beach Pelicans. August 13, 2012 Phil Klein assigned to Myrtle Beach Pelicans from Hickory Crawdads. April 3, 2012 Phil Klein assigned to Hickory Crawdads from Spokane Indians. July 14, 2011 Phil Klein assigned to Spokane Indians from AZL Rangers. June 11, 2011 Phil Klein assigned to AZL Rangers from Texas Rangers. June 10, 2011 Texas Rangers signed RHP Phil Klein.